The pattern in Peru is EXACTLY the same as what has been happening in New Zealand: anomalous earth-quake activity and unusual strandings of cetaceans in the presence of 'seismic exploration' vessels as well as 'radio frequency installations' or technologies that could easily be integrated into a 'HAARP-based' technetronic weapons network. That part of Peru has had at least five earthquakes in the past two weeks, including a 4.8 on 11 February, two days after the dolphins began to strand at Chiclayo. This is EXACTLY like what happened in the Christchurch area only two days before the February 22 2011 quake, when a large pod of dolphins became disoriented near Thames and were successfully guided back to sea by thoughtful people. In addition, an extremely large 'ionospheric research facility' exists a few hundred kms inland from Chiclayo at Jicamarca.This facility, operated by Cornell University, is VERY MUCH like an older version of HAARP. They call it a 'radio-telescope' and indeed, even HAARP can be used for 'listening'. But ANY radio receiver/antenna array can function equally as a transmitter; moreover, it's well known that most if not all of the world's radio-telescope installations function at least in part as ionospheric research instruments, beaming radio/micro-waves in exactly the same way that HAARP does. "260 Dead Dolphins Scattered on Shoreline of Peru, Just Days After Mysterious U.S. Incident"
18 turtles, 22 sea lions , 8 dolphins , 16 porpoises , 22 pelicans and others. 2. 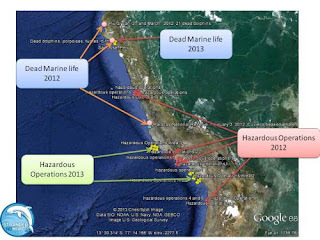 Anthropogenic Noise Activities: Possible Military Operations AND Seismic surveys. Now, we do not know what these hazardous operations included exactly, but they were likely involving some military testing. 4 USA should pay attention, this is what will be happening on the US shores very soon. Peru is located in seismically active area, but see for yourself , there have not been any significant or notable offshore quakes in last 30 days, except for a few small ones, including 4.7 one happening 86km SSW of Acari, Peru. Now what is interesting is that hazardous operations also took place on Jan 30 not that far from this place. Approximate locations of seismic surveys area that could have been happening prior and during Peru’s marine life die off. The locations are approximate and for reference only as we do not have actual data, tracks and coordinates. Note that in 2012 there were more operations, larger area and the die off was bigger. This needs to be INVESTIGATED. Had it been investigated last year, this year die off could have been prevented. This cannot go on like it does, it is like a bad dream repeating itself over and over again.